Mayfair Book Auctions | VISENTINI, Antonio. [View of Venice]. MBA002: Lot 57. VISENTINI, Antonio. 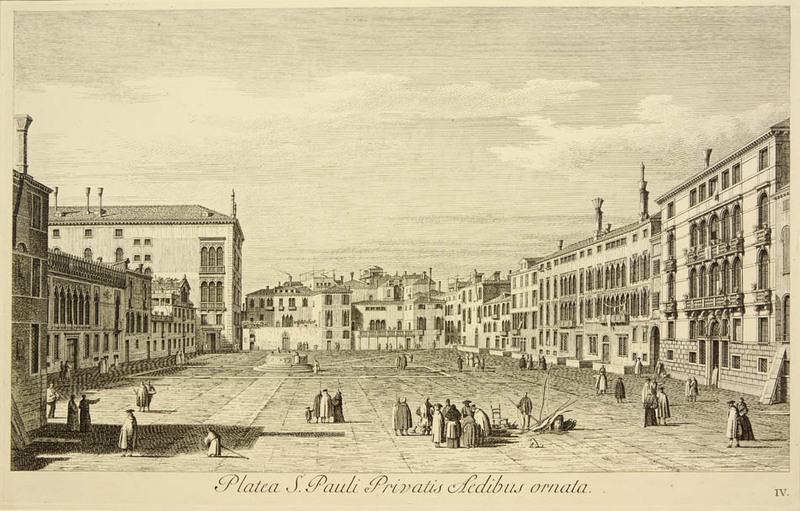 The piazza San Paolo, or more familiarly San Polo, is the second largest in Venice after the piazza San Marco. Originally open grazing land, it was paved over in 1493, and soon became a public forum for bullfighting, sermons and festivities such as masked balls, commedia dell-arte and carnivals. This scene also includes one of the few wells or fountains to be found in Venice. “”Self-styled as painter, architect, and engraver, Antonio Maria Visentini (1688-1782) enjoyed a long career in Venice where he was connected to the Accademia and to the artistic and publishing circle centred around his patron, Consul Joseph Smith. Visentini&apos;s etchings are distinguished in the confidence and authority of their perspectival projection and etched line. Visentini&apos;s buildings seldom sag and never “”sink”” under their own weight into the water of the canals as they occasionally might in the work of Carlevaris and Marieschi. Canaletto&apos;s compositions are quite various and are refreshingly dramatic in the contrast between the large foreground buildings and the smaller ones in the receding perspective. These views were crucial to forming the image of Venice in the mind of its visitors”” (Millard). Engraving after Canaletto, 405 x 555 mm.